Every time you get into an automobile, whether as a driver or a passenger, you are on the verge of taking a risk. Even if you or the person you are driving with is an exceptionally safe and vigilant driver, you cannot assume that to be true of everyone else on the road. All you have to do is look around you at the other drivers who are sharing the road. For every five people who are paying attention to the road, you’re likely to see one who is checking himself or herself out in the rear view mirror, talking on a smartphone, or fiddling with a CD player. Especially on the densely packed roadways of a city like Brooklyn, auto accidents are an unfortunate possibility even when drivers are observing all of the rules of the road. When technological and other distractions enter the mix, the risk of serious accidents becomes astronomically higher. 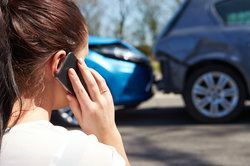 If you or a member of your family has been catastrophically injured in an auto accident caused by a distracted driver, or if you have lost someone you love in such an accident, the personal injury attorneys of the Law Office of Gary A. Zucker & Associates, P.C., can represent your rights and help you obtain the compensation to which you are entitled. Many people believe that they can take their eyes off the road for a few moments without risking an accident. They trust that their peripheral vision will come to their aid, or perhaps that the brake lights of the car in front of them will command their attention. Tragically, it takes an accident to divorce many of these drivers of this misconception. When an accident occurs due to any of the above driver distractions, the distracted driver can be held liable for any resulting injuries or deaths. The auto accident attorneys of the Law Office of Gary A. Zucker & Associates, P.C. expertly handle cases involving such accidents, using all of the resources at their disposal to investigate and reconstruct the accident and build the strongest case possible on behalf of the victims and their families. To learn more about auto accidents and driver distractions, or to arrange an evaluation of your distracted driver accident case, please contact the experienced personal injury lawyers of the Law Office of Gary A. Zucker & Associates, P.C. today.